Organise your child's bedroom with our gorgeous storage boxes. The perfect addition to any child's bedroom or nursery, these practical foldable storage boxes are great for keeping you little ones room tidy. Easily foldable and fit perfectly onto shelves, these decorative storage boxes are perfect for keeping toys and accessories safe. 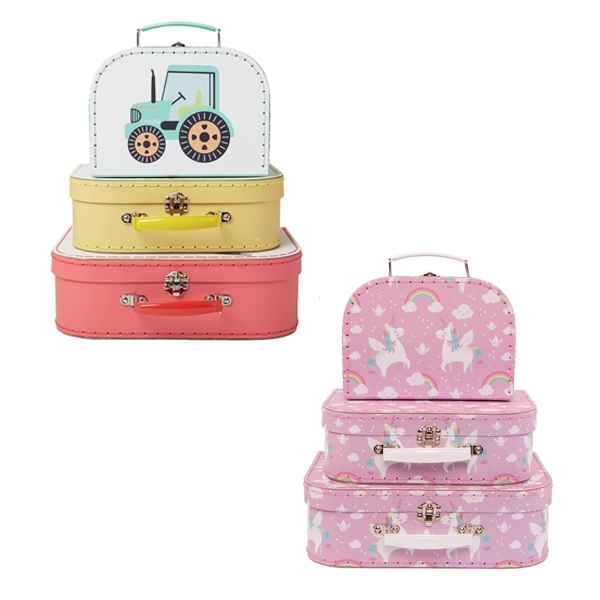 Why not try our adorable set of 3 storage suitcases, beautifully decorated in colourful and themed patterns, these stackable cases are great for kids on-the-go! Stash away your children's toys, accessories and games in our durable and sturdy storage suitcases.Perfectly designed for colourful and themed bedrooms.